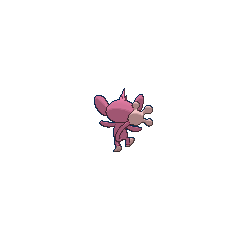 Aipom in game: 3,641 Who? Important notice! 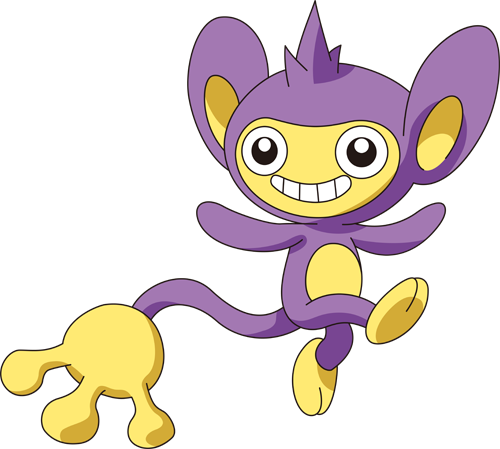 Pokemon Aipom is a fictional character of humans. Aipom uses its powerful tail freely and cleverly for many purposes. The tail is strong enough to anchor Aipom to a branch and suspend the rest of its body in the air, but also delicate enough to pick fruit and manipulate objects. Aipom has been known to wrap its tail around tree branches as it sleeps so it does not fall. 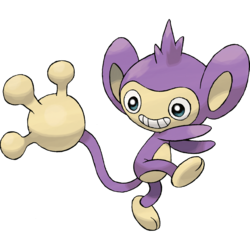 Since Aipom uses its tail so much, its actual arms are not as dexterous. Aipom lives high in the treetops, using its tail for balance as it swings from branch to branch. Multiple Aipom appeared in Slaking Kong, one of which stole Ash's hat. In Channeling the Battle Zone, Ash captured the aforementioned Aipom. Her behavior is similar to that of Ash's Chikorita: attention-seeking, very naughty at times, and occasionally jealous. However, she developed a close bond with Ash. In Throwing the Track Switch, Ash traded her to Dawn for Buizel because Aipom had a love of Contests and Buizel was more interested in Gym battles. Aipom evolved into Ambipom in Journey to the Unown! while battling the attacking Unown. 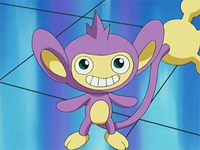 Aipom first appeared in Spell of the Unown: Entei under the ownership of Lisa. An Aipom made off with one of Delibird's missing presents in Delibird's Dilemma. A group of Aipom were causing mischief in A Hot Water Battle. In Hocus Pokémon, an Aipom's tear was needed for a spell. 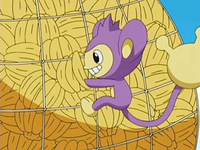 An Aipom appeared in Pikachu and the Pokémon Music Squad. Two Aipom were part of a Pokémon street festival in Doin' What Comes Natu-rally. Three Aipom were among the inhabitants of an oasis just for Pokémon in Got Miltank?. In Extreme Pokémon, a recently hatched, baby Aipom appeared in a Pokémon Egg Ranch. An Aipom was one of the Pokémon seen in a forest outside the Ice Path in EP250. An Aipom made a brief appearance in Pokémon Heroes: Latios & Latias, where it watched the Tour de Alto Mare, a water chariot race. Four Aipom were among the Pokémon resting in some hot springs in Entei at Your Own Risk. Various Aipom appeared in A Bite to Remember. 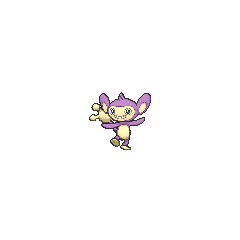 An Aipom appeared in Hi Ho Silver Wind!. A wild Mew took the form of an Aipom in Lucario and the Mystery of Mew. An Aipom appeared in The Saffron Con as a Pokémon owned by a Coordinator. A Trainer's Aipom appeared in Off the Unbeaten Path participating in the Pokémon Orienteering. An Aipom also appeared in Historical Mystery Tour!. An Aipom made a very brief appearance in League Unleashed!. In Pokémon Adventures, Gold has an Aipom named Aibo which first appeared in Murkrow Row, one of the Pokémon he grew up with at his house in New Bark Town. Because it was not very powerful, it was typically used in situations that needed its dexterity or for distracting opponents with Double Team. In the battle against the Masked Man, it showed its worth by having Sudobo inherit the speed boost of its Agility to restrain the villain. It was also very skilled with pulling fast ones or using Gold's equipment to send out multiple Pokémon at once, as displayed when it spun Gold's billiard cue around to power up Exbo's Blast Burn attack. In the HeartGold & SoulSilver chapter, it was revealed to have evolved into an Ambipom. Its evolution was later depicted by flashbacks. Aipom appears to be based on a monkey and the exaggerated concept of a prehensile tail. It may be specifically based on the squirrel monkey, which is similar in appearance. 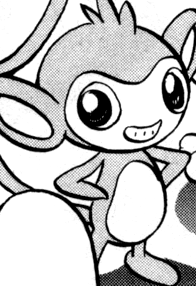 Aipom also shares its large smile with a cymbal-banging monkey toy. It is also similar to an ahuizotl, a creature of Aztec mythology with monkey hands and a fifth human hand on its tail.